One of my personal goals for this year is to cut out 85% of my meat and dairy consumption. I have failed so far. Somehow I managed to cut out 100% of my meat consumption and only about 1/4 of my dairy consumption (I love cheese! It makes my mouth water just thinking about it). I do not have a desire to be a vegetarian. I enjoy meat but for some reason I just haven’t been able to eat it (I am sure the crunchy documentaries I watched on Netflix did not help). I haven’t craved it or missed it and I have not gone out of my way to cook it and because of this, I have not eaten meat for over a month now. I am at a point with my cooking and diet where I am experimenting more and more in the kitchen with meatless meals and trying a new range of ingredients (which I plan on posting). My husband is on this journey with me (in part because I do most of our cooking) but he loves meat and is not willing to give it up as easily as I am. Which is perfect. One of my “when I grow up fantasies” is to have a catering business or at the least to work in a professional kitchen (and why am I in grad school?). I will occasionally post recipes with meat to keep the hubby happy but also because I feel it’s important to know to cook it. Hence my first post will be a very chicken-y one and is dedicated to my cousin Tiffany who was extremely patient with me when waiting for this recipe. The first time time I made this, it was an absolute disappointment. 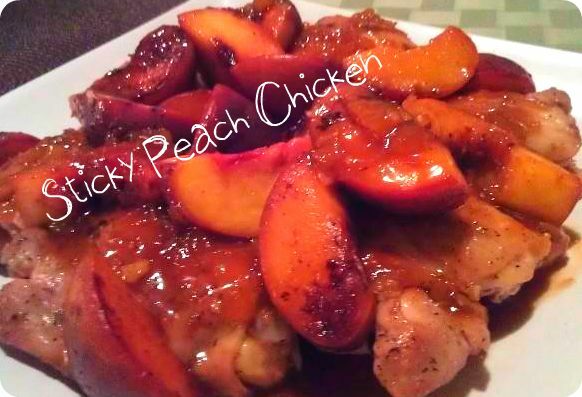 The chicken was not cooked through (I was using the wrong type of pan), the peaches were soggy and it just did not turn out the way I envisioned it. Not being one to give up one something I know should taste good, I tried it again. And again. And again until I got it right. The chicken had a crispy outer layer, the peaches held their texture and the glaze became a staple for not only chicken but pork chops and tofu. It’s a temperamental recipe and those who are impatient in the kitchen (patience is something I struggle with) just breathe and trust that the chicken and peaches will work their magic. Preheat oven to 350 degrees. Heat a cast iron skillet over medium high heat (this is important. The cast iron is a must for all kitchens but especially for this recipe) with 1 tablespoon extra-virgin olive oil and 1 tablespoon butter. Before placing the chicken thighs in the skillet, generously season them with salt and pepper. You want the chicken to have space between them and to get a lovely golden crust which should take 4-6 minutes. Flip them and allow the other side to also develop a golden crust, another 4-6 minutes. Take the entire cast iron and place it in the preheated oven and allow the chicken to cook through (about 20 minutes- remember to flip halfway through). While the chicken is cooking, in a medium pan add the remaining tablespoon of butter and olive oil and gently place the peaches in the pan along with the juice of the lemon. You want them to be tender and lightly golden which should take 8-10 minutes. Remove them from heat. In the same pan that was used for the peaches add the onion, the ginger and the vegetable stock. Allow the onions to get a little tender and then add the peach preserves, red pepper flakes and Worcestershire sauce. It should be sweat but have a slight kick to it because of the red pepper flakes. Add more spice if you see fit. Cover the sauce and allow it to thicken. Once it is at the right consistency, reintroduce the peaches to the pan and turn of the heat. Remove the chicken from the oven and place on a serving tray (I am a sucker for presentation) and generously spoon the peach mixture over the chicken.